Brought to you in partnership with Aer Lingus. That’s amazing annual travel rewards worth over €229* for €7.99 per month! Once you’re approved you’ll need to join AerClub, the loyalty programme of Aer Lingus and then link your Aer Credit Card with your AerClub account to unlock your travel rewards. It’s really important you do this. you’re ready to take advantage of all the great travel rewards on offer. 2 Fast Track & Priority Boarding Passes: on Aer Lingus operated flights out of Ireland at selected airports every Reward Year. 2 Lounge Passes: to access airport lounges at Dublin, Cork, Shannon and Belfast every Reward Year. Low cost instalment option: Spread the cost of larger purchases at a great low rate by taking advantage of our unique credit card Instalment Plan. Contactless: Contactless is a fast, easy and secure way to pay for items. Chargeback Rights: Your online purchases are never safer than when you pay with your Bank of Ireland MasterCard credit card. If something goes wrong, you can relax knowing that you’ll get your money back, whether your parcel gets lost in transit or your purchase is faulty or in the event fraudulent activity. Representative example of Aer Credit Card purchase at standard interest rate of 16.12% variable. Typical Annual Percentage Rate (APR) of 26.6% variable including annual Government Stamp Duty of €30 and an Annual charge of €95.88 (this is made up of 12 monthly charges of €7.99). Assuming purchase of €3,000 repaid in equal instalments over a 12 month period. The total amount repayable by customer is €3,387.90 which includes initial purchase of €3,000 and a total cost of credit of €387.90. Representative example of Classic Credit Card purchase at standard interest rate of 16.12% variable. Typical Annual Percentage Rate (APR) of 22.1% variable including annual Government Stamp Duty of €30. Assuming purchase of €1,500 repaid in equal instalments over a 12 month period. The total amount repayable by customer is €1661.01 which includes initial purchase of €1,500 and a total cost of credit of €161.01. Representative example of Platinum credit card purchase at standard interest rate of 13.79% variable. Typical Annual Percentage Rate (APR) of 19.6% variable including annual Government Stamp Duty of €30 and an Annual Charge of €76.18. Assuming purchase of €5,000 repaid in equal instalments over a 12 month period. The total amount repayable by customer is €5,479.71 which includes initial purchase of €5,000 and a total cost of credit of €479.71. Representative Example of Affinity credit card purchase at standard interest rate of 14.57% variable. Typical APR of 20.2% variable including annual Government Stamp Duty of €30. Assuming purchase of €1,500 repaid in equal instalments over a 12 month period. The total amount repayable by customer is €1,648.38 which includes initial purchase of €1,500 and a total cost of credit of €148.38. 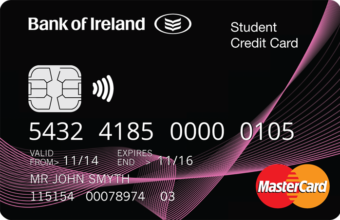 Representative example of Student credit card purchase at standard interest rate of 14.54% variable. Typical APR of 20.2% variable including annual Government stamp duty of €30. Assuming purchase of €1,500 repaid in equal instalments over a 12 month period. The total amount repayable by customer is €1,648.14 which includes initial purchase of €1,500 and a total cost of credit of €148.14. 1.5% subject to a minimum of €2.54 per transaction. A cash Advance fee of 1.5% will be applied to a Euro converted amount including the 2.25% Cross Border Handling Fee referred to above, subject to a minimum of €2.54 per transaction. 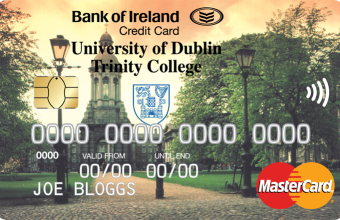 A processing fee of 1%, minimum €1.27 and maximum €6.35 will be charged where payment to a credit card is made by foreign cheque. Effective as at 21st January 2019. Rates, Fees and Charges effective as at 21st January 2019. Introductory offers apply to new customers only. Balance transfers may not be made from existing Bank of Ireland credit cards or from credit cards outside the Republic of Ireland or United Kingdom. The balance transfer rate is available for a maximum period of seven months from the date of account opening. Customers who do not provide details of a balance to be transferred will automatically receive 0% APR on purchases for a period of six months from the date of account opening. After six months from the date of account opening 0% APR on purchases reverts to the standard variable rate applicable to your card and the standard variable rate will apply to the balance outstanding at that time. After 7 months the fixed rate of 0% APR fixed on balance transfers reverts to the standard variable rate applicable to your card. Rates currently applicable to Bank of Ireland personal credit cards are outlined in the table above. Rates quoted are effective as at 21st January 2019 and are subject to change. Lending criteria and terms and conditions apply. (1) A minimum of two seats per flight will be available, except for Restricted Periods. Seat availability on the Aer Lingus website or through a booking agent does not guarantee a free return fare. (2) Avios are issued and redeemed in accordance with Avios Terms and Conditions. Please see www.avios.com for more details. (3) Acceptance criteria, terms and conditions apply. Bank of Ireland Travel Insurance is underwritten by AIG Europe Limited. Please see tab above for full Travel Insurance Terms and Conditions. (4) 0% interest available for new credit card customers for the first 6 months for purchases or 7 months for balance transfers from the date of account opening. At the end of the introductory period the annual interest rates will revert to the standard interest rate applicable to your card at that time. (5) 24 hour approval means next working day provided that we are in receipt of all relevant information and documentation. Applications for non Bank of Ireland customers and applications referred to underwriting may take longer. Aer Credit Card is brought to you in partnership with Aer Lingus. Over 18s only. Lending criteria, terms and conditions apply. Subject to a monthly fee of €7.99. Bank of Ireland is regulated by the Central Bank of Ireland.